His excellency seems like a good and honest man. Thank you Nazanin, you have been very active and supportive throughout this ordeal. 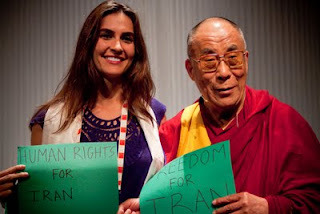 And thank you Dalai Lama, your support means a great deal to the Iranian people. Thank you your holiness! The Iranian nation will likewise stand with you in your struggle for self-determination. But Iranians are already free. Their country is not being occupied by a foreign power like the occupation of Tibet by China and of Iraq and Afghanistan by the US. Their complaint is against the 'dictatorial' nature of the Ahmedinejad/Khamanei administration and the human rights abuses. But quite honestly which government in the world has not acted like that when threatened with being overthrown and which government is actually 'democratic'. The poster, who claims "iranians are already free", is clearly retarded. Anyone who thinks Iran is free or that Ahmadinejad / Khamanei is a democratically elected administration clearly has no idea about what goes on in Iran. Great job Nazanin and thank you Dalai Lama.